The achievements of Karl Bryullov in the portrait area were recognized as unconditional and uncontested, including by such harsh critics as Vladimir Stasov and Alexander Benois. The best examples of Bryullov’s ceremonial portrait belong to the depiction of Countess Julia Pavlovna Samoilova – the ideal of his entire life. Karl Bryullov admired this woman from the first day of their meeting in Italy until her last breath, before the one who, for the liberty of views, for independence of behavior, was disliked by the autocrat Nikolai I, the all-Russian, her distant relative. 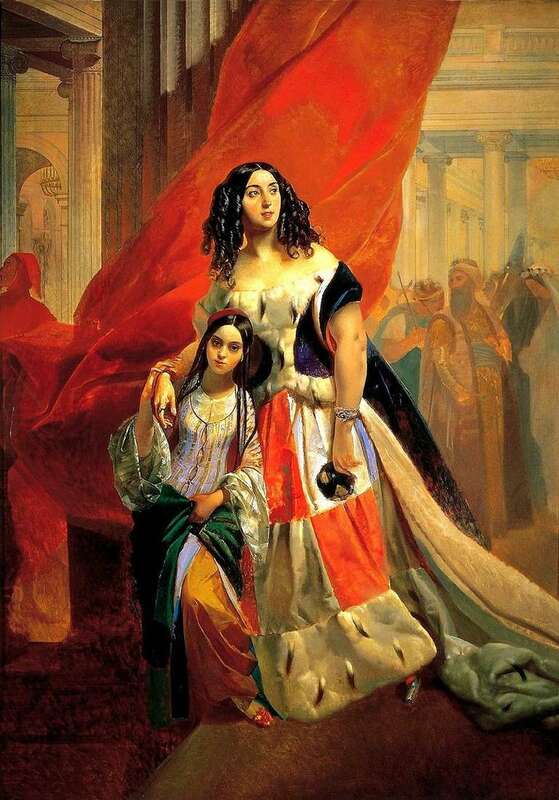 In a difficult time for Bryullov, the collapse of personal happiness and harassment from the court circles, Samoilova came from Italy to support her friend. Disdaining the opinion of the world, she surrounded the artist with tender participation, took him to his estate near Pavlovsk – the Countess of Slavyanka. This was a direct challenge to the court, who was in Pavlovsk and saw how the lines of guests were going to Samoilova. Bryullov began to paint a portrait, which again had to show everyone his ideal in life and in art. “Portrait of Countess Julia Pavlovna Samoilova, retiring from the ball with the adopted daughter Amacilia Pacini,” – the peak of the work of Bryullov, the portraitist. The red rising curtain cleans the flame, separates Julia from the masquerade boiling behind the jester’s merry-go-round, from the sultan’s figures rising from the monotonous motley, from Mercury leaning towards him, an obliging ambassador pointing at the beautiful woman leaving. The beautiful face of the Countess is open – not only freed from the mask, but open to every movement of a sincere, passionate soul, imprinted on it: she leaves this masquerade of life, where everyone tries to impersonate not who he really is. The second name of the portrait – “Masquerade” – corresponds to the subtext, the second, the main plan of the artist’s plan. In this world of lies, Samoylov, full of human dignity, disdainfully discarded the mask, proudly demonstrates his innocence to the play of light. Soon, Julia leaves Russia. Bryullov will no longer be seen with her. Together with “The Horseman” and “Portrait of Yu. P. Samoylova with Giovannina Pacini and Arapka”, created during the work on the famous “Pompeii”, this portrait forms a sort of triptych dedicated to the famous beauty. Description and meaning of the painting Portrait of Countess Samoilova by Karl Bryullov.